New tools that are currently in development. These tools are available in English because they are still in development. This tool allows you to do multiple replacements at once. You can specify a range with 2 columns with search and replace values, which allows you to do many replacements automatically after each other. The target can be a certain range, your current worksheet, all selected worksheets, the entire workbook or any other workbook that is opened. The search/replace is done in both cell values and hyperlinks. The range with these search and replace values are always excluded from the target range. Your last used settings are remembered. This tool changes the MAC addresses (such as 0123456789ab) in your selected cells into a more readable and standardized format. If required this tool will automatically remove any spaces, hyphens (-), colons (:) or points(.) first, so that you can also easily convert it from one format to another. This tool converts (long) HEX values in the selected cells to ASCII text. For example, it converts "446f6e277420796f75207468696e6b207468617420457863656c2069732067726561743f" to "Don't you think that Excel is great?". This tool detects adjacent cells with the same value and merges those cells into a single merged cell using Excel's merge. Useful for quick styling of tables for presentation purposes. This tool puts a space in front of Captital letters in the text in your selected cells. This tool allows you to keep or delete the characters inside the cells in your selection that have a certain formatting applied (* Rich text formatting). You can choose to either keep or delete bold charters, italic characters, strikethrough characters, single underline characters, double underlined characters or normal characters within each cell in your selection. With this utility you can easily remove the duplicated records from your sheet. You can also have it remove records from your sheet that already exist on another sheet, which can for example be useful if you are working with mailing lists. This tool takes the data in each of the columns on your worksheet and puts this data below each other in column A. 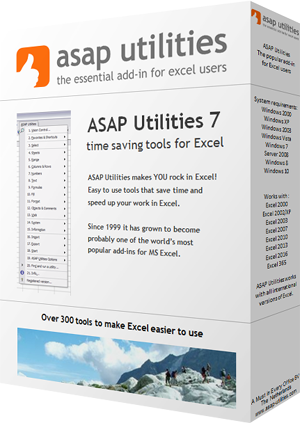 This tool refreshes all pivot tables and external data ranges in your entire workbook. This tool creates a report in a new workbook with information about the pivot tables in your workbook. The report shows the following information: Sheet, Data Source, Name, DataBodyRange, DataLabelRange, RowRange, ColumnRange, TableRange1, TableRange2, Date last refreshed, Refreshed by, RefreshOnFileOpen, Fields in source, Record in source, Fields shown, SourceType, SourceDataFile, Connection, CommandText. This tool shows the indented structure of your formula. This is useful when you have a nested formula. That way you can more easily see if the brackets are placed properly. You can also edit the formula. This tool sorts each column in your selection individually from top to bottom. This tool sorts each row in your selection individually from left to right. This tool allows you to split the values inside the cells into separate columns, based on a change in the applied formatting (* Rich text formatting). It is a similar to Excel's Data > Text to Columns, however in this case the splitting is done based on changes in the applied formatting. This tool transforms a table into a 3 column table that you can easily use as a source for for example a pivot table. This tool ungroups all the grouped columns in the selected worksheets. This tool ungroups all the grouped rows in the selected worksheets.